Find all your welding and gas supplies, including safety equipment and cylinder lease, under one roof. Janning Welding and Supply serves clients in and around Elk City, Oklahoma. Janning Welding and Supply carries abundant nitrogen and helium gas supplies for professionals in the field, plus light towers, sand separators, and welding machine rentals and sales. Our safety equipment range includes glasses, gloves, welder's caps, and welding helmets. Our stock is currently being updated. Check back in the very near future for an update. Get the metal you need, cut to precise dimensions. We stock aluminum, mild steel, carbon steel, and stainless steel, alongside metal building components including panels, tubing, and squares. We can provide you with fencing materials, gates, panels, posts, custom fencing; and we can design and build your new barn. 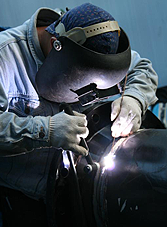 Contact us for welding supplies, gas supplies, and safety equipment, plus cylinder lease.